So during my round up of my fave Valentine's Day wreaths on that there internet, this one was by far the most adorable, and I knew I had to re-create it! The problem with Pinterest is that sometimes photos Pinned only lead to Tumbler, or just a jpeg photo, with no blog in sight. Well, I think it is from this blog, but I can't find it. And it's in Swedish. But, luckily, this one appeared pretty straight forward. 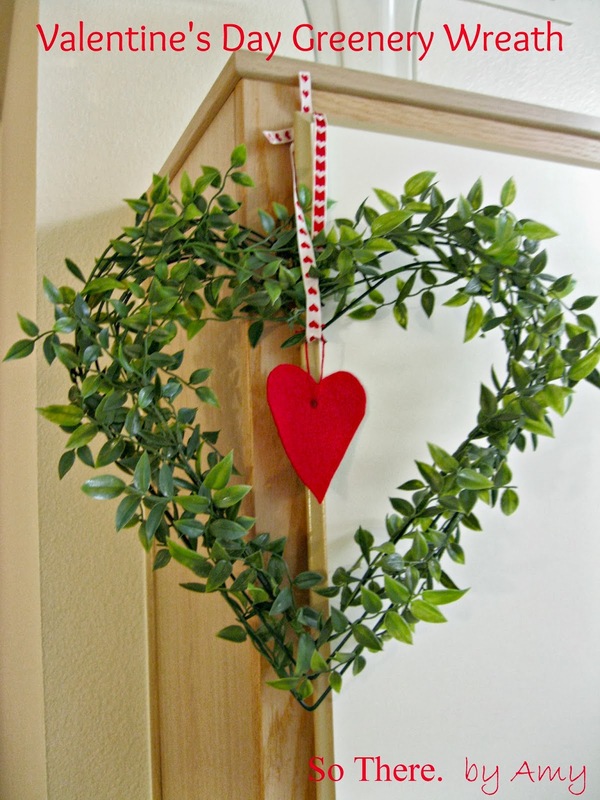 This one was made from a wire coat hanger, but luckily, the amazeballs store that is Hobby Lobby, actually had wire wreath frames in the shape of a heart! Score. 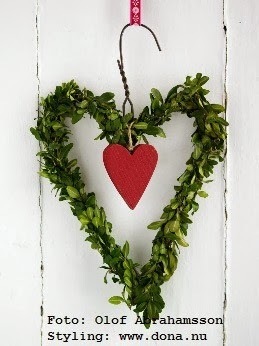 I scoured their greenery garland section for one that looked similar to these small olive branch leaf-looking greens. And success. Another score! Finally, I got some green floral wire and floral tape (couldn't decide which would work better) to attach the branches to the wreath frame. I had embroidery thread, ribbon, and red felt at home, so I was all set! I think the photo might have used a wooden heart, instead of felt, and I bet you could find that in the wood painting section of the craft store, and paint one red. Easy Peasy. So, clip off long lengths of the garland, and attach around the wreath with floral tape. I should have tried thin wire, possibly, instead. Floral tape is weird! Have you guys used it before? It isn't sticky at first, until you stretch it out and start to wrap it around, so it was a bit tricky to get used to, at first. But it did end up working. This wreath frame had three layers, so after I made one full heart, I went back in and filled in the bare spots with more of the garland, on the other wires. Next, cut a heart from felt, hole punch a hole in the top-center, and tie with embroidery thread at the top of the wreath, making sure the length of the thread allows the heart to end up where you like it, in the middle of the wreath. Hot glue to stay in place. Tie another ribbon, or strip of burlap, around the top, as well, to hang your wreath! And voila! Adorable and festive!